Here’s a rundown of our favorites, including our top pick – Mueller Fitted Wrist Brace Green Line. Carpal tunnel syndrome, also known as median nerve compression, occurs when the median nerve that runs from the palm to the forearm becomes pinched. While symptoms can vary depending on the severity of the condition, most people with carpal tunnel complain of numbness, weakness, tingling, or shooting pains in the hand and/or wrist. Splinting is one of the most common treatments for carpal tunnel. It’s also one of the most popular as hand braces are non-surgical, drug-free, and available without a prescription. If you’re suffering from carpal tunnel, a hand brace can help put your wrist into a neutral position which in turn may reduce your symptoms. Our team has tested a variety of hand brace options currently on the market to determine which are the best. Adjustable: Most hand braces for carpal tunnel feature Velcro or a similar material to tighten the brace around the arm and wrist. Rigid Splint: The splint is what positions the wrist in a neutral position to help reduce symptoms. Ensure that the splint is rigid for proper stabilization. Soft Material: As you’ll likely be wearing your hand brace for several hours during the day, you’ll want one made from a soft material. Flexibility: In addition to having the brace made from a soft material, it should also have some flexibility or stretch so that you can continue to use your hand. A quality hand brace can quickly reduce or even eliminate discomfort caused by carpal tunnel. 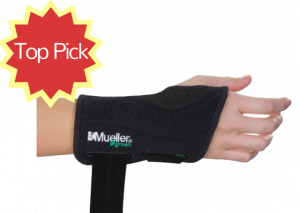 After trying numerous hand braces, we found the best non-prescription option to be the Mueller Fitted Wrist Brace Green Line. Designed exclusively for the right hand, this versatile hand brace is able to accommodate users with both slender and larger hands and wrists. The lightweight fabric is comfortable enough for all day use and the two adjustable straps help create a custom fit. For extra stabilization, the hand brace features two support stays with padding around the spoon. With the splint in position, the brace is able to relieve pain and swelling caused by carpal tunnel while still allowing the user to maintain full movement of the fingers and thumb. For lefties, there is also a left-handed option as well as a range of sizes to satisfy all users. 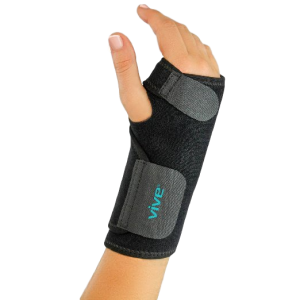 For premium compression at an affordable price, try the Wrist Brace by VIVE. With thousands of satisfied customers, this versatile wrist brace has proven to be a top contender when it comes to alleviating pain caused by carpal tunnel, arthritis, or tendonitis. After trying the wrist band, we found it to be comfortable and functional. The brace is made with breathable neoprene fabric which gives it just the right amount of flexibility with a removable splint that provides the wrist with excellent stabilization. Another major selling point of this wrist brace is its customizable features. The extra-strength latching straps around the wrist and between the thumb and fingers allow you to create the perfect fit, no matter how small or large your hand. If you prefer a more flexible brace, the splint can also be removed. With its unique design, you also won’t have to worry about constantly readjusting. If you prefer a more flexible hand brace option, go with the CopperJoint Copper Wrist Support. This practical compression sleeve features breathable, high-performance fabric that helps to maintain optimal joint temperature for proper healing. The fabric is also anti-itch, UPF 50+, and gentle enough to prevent irritation or chafing. Ideal for all day and night use, the wrist support will keep you dry and comfortable during use. There are several aspects that our team loved about this hand brace. First, it doesn’t slide, roll, or slip even after hours of use. The strong fabric also reshapes flawlessly after every removal. In addition to providing relief from conditions like carpal tunnel and arthritis, the hand brace also stimulates oxygen airflow to the muscles and enhances blood circulation for faster recovery. A full hand brace is not always needed for mild cases of carpal tunnel. 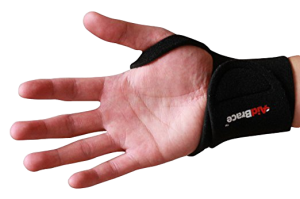 For these individuals, a compact brace like the AidBrace Adjustable Wrist Support Wrap offers ample stabilization. This versatile brace comes in a convenient pack of two and provides adequate compression in the wrist as well as warmth and improved circulation. The unique design allows the brace to be worn on either the right or the left hand and the neutral black coloring makes the brace unisex. The wrist support wrap is designed for everyday use and can help with a wide range of wrist problems such as carpal tunnel, arthritis, cubital tunnel, wrist sprains, and tendonitis. The flexible neoprene material is moisture-wicking which ensures that your skin stays dry and free of chafing. Your purchase also comes with a money-back guarantee. The median nerve and several nearby tendons that run from your hand to your forearm are referred to as the carpal tunnel. 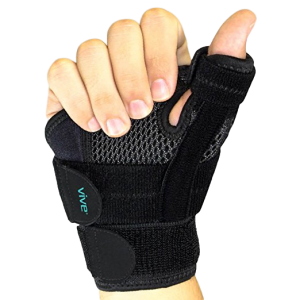 The Vive Arthritis Thumb Splint targets this small space to reduce pain, weakness, and tingling that can occur when the area is compressed. This unique brace design has an individual thumb hole as well as a removable thumb splint that helps keep the hand and wrist in an optimal position. After testing the brace, we found it to be highly effective in helping the hand and wrist recover from carpal tunnel and similar conditions like arthritis and sprains. The hand brace also features high-quality extra-strength straps that do not require readjusting for all day and night use. Your purchase of the Vive hand brace is protected by a 60 day warranty.